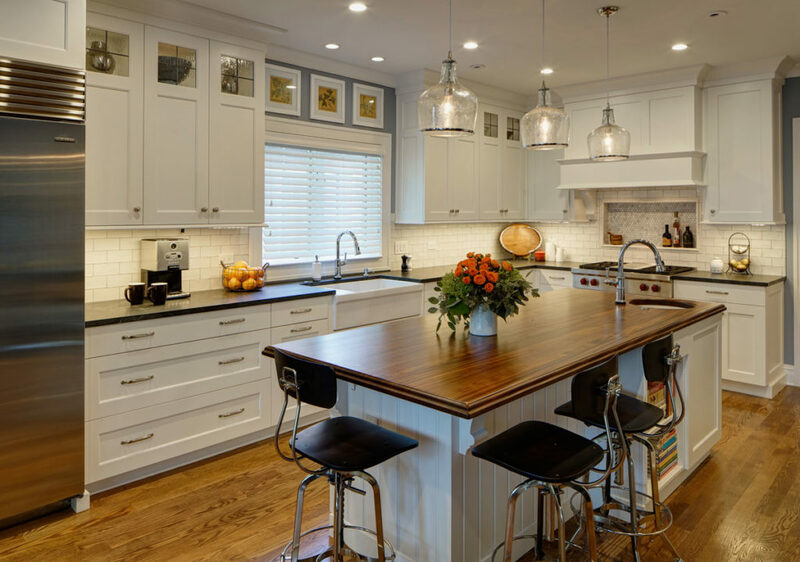 Our Custom Wood Countertops Blog features a kitchen that includes an Oil Finished Walnut Countertop designed by TruKitchens. Some of the industry’s best have designed Grothouse custom counters to complement decorative backsplashes to create unique and outstanding designs. 1 in 4 homeowners combine two or more kitchen countertop materials when renovating. Wood countertops are paired with marble, quartz, granite and metal. Custom wood countertops are designed for laundry rooms to be used in the wash station, as extra counter space, or for bench seating. Our Custom Wood Countertops Blog features a Reclaimed Chestnut Kitchen Island Countertop designed by Phoebe Steinhoff-Smith of Coastal Cabinet Works. Powder rooms have been used for centuries, but today they include design elements like vanities with unique powder room vanity countertops. Our Custom Wood Countertops Blog features Walnut Countertops for Kitchen Island Ends designed by Eva Andersen of Teakwood Builders.